Baroness Doreen Lawrence and solicitor Imran Khan last night addressed an audience at London South Bank University (LSBU) for the annual Legal Action Group Lecture. 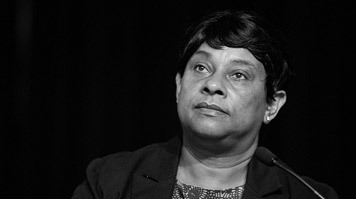 Baroness Lawrence and Imran Khan have campaigned side by side for more than 20 years, following the racially motivated murder of Baroness Lawrence's son, Stephen Lawrence, in 1993. The lecture was a rare opportunity to hear the two talk about their fight for justice, which has prompted two major inquiries, and led to changes in the law, as well as major shifts in social attitudes towards race and policing. Since her son's murder, Doreen Lawrence has established the Stephen Lawrence Charitable Trust and campaigned for victims of racist crime. In 2003 she was awarded an OBE for services to community relations and in 2013 she was appointed as a Life Peer in the House of Lords. Imran Khan, a Visiting Professor at LSBU, has previously been recognised by the Legal Action Group for his "doggedness and determination in the face of substantial legal and other hurdles." The lecture focused on the legacy of the legal campaign for justice and also explored recent cuts to legal aid. Mr Khan has said publicly that he would have been reluctant to take on the Lawrence family's case if it had come to him once the government's legal aid cuts had gone through. Find out more about Law at LSBU.